Well, this is far too long to put on Facebook, and since my friends have been so supportive and kind about this whole adventure, I’ll actually do a blog post! Shocking, I know. 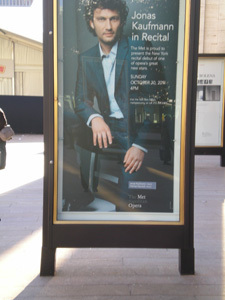 On Sunday, October 30th, I went to a 4pm recital of German and French lieder given by Jonas Kaufmann, a German tenor. For those who might not know, a lieder recital is done with piano accompaniment–and the Met holds 3800 people plus standing places, not exactly an intimate venue. But it worked! The music was glorious (I thought). He had the audience, which appeared to consist of an outing from a tuberculosis sanatorium, in complete silence the entire time, except for endless coughing. I had a bag of Ricolas at the ready should a tickle have even dared to appear in my throat! I could see (and of course hear) perfectly. The parterre boxes are literally little ‘closets’ with a tiny anteroom/cloakroom where I could hang my coat and a bench with our programs stacked there ready. A place for the rich, who usually populate that area, to leave their furs instead of the public cloakroom! There was a Playbill with an introduction to each composer (Liszt, Mahler, Duparc, Strauss) and lyrics in German or French, and English translations. However, this must have been deemed too tiny for the aging eyes of the majority of the audience, as the Met also got out the copier and made a larger (legal size) version of all this that was stapled together! I have to admit it was much easier to read–although I have a personal thing–I never read the lyrics/text at a recital or concert. I may glance over them, but I just concentrate on the music and don’t really worry about the words. It’s just the way I roll. First up were six songs by Liszt. Jonas Kaufmann does not throw himself around the stage or really engage in histrionics of any kind while singing lieder. Instead I think he allows his artistry and supreme technique to use the music itself to express the emotions and words in the songs. I found the Liszt very enjoyable, especially the last one, “Die drei Zigeuner”, with descriptions of the three men carefully differentiated. The crowd brought them back with applause during the short break between Liszt and the next group, Mahler/ Five Rückert Lieder. I loved the first one, called “Ich atmet’ einen linden Duft” (literally, I breathed the scent of linden) simply because I love the smell of linden trees in spring, which I associate with London and Munich, but that’s just a personal thing. The last Mahler piece, called “Um Mitternacht” was full of emotion and very striking. I say this because I have already read criticism that JK was not “fully invested” in anything until the last Strauss songs. I didn’t feel that way at all, but then *I* was fully invested in listening right from the beginning, so… He certainly got my involvement in all the music, even though I was only familiar with the Strauss songs, which are very dear to me after listening to his Strauss CD, oh about a million times. I had just bought a new pair of small binoculars (hey, I need them for basketball games), and even though I had an excellent seat I was quite often looking through them to catch even more of the subtle interplay of words and music as played out on the singer’s face. I was impressed with the way that his sound was perfectly judged to fill the Met with the piano accompaniment, without sounding overpowering (his Wagner voice, to cut through a Wagner orchestra) or too soft (of course there were many pianissimi but they were still perfectly audible). Apart from the size of the venue, the recital did still have some intimacy about it. Again, off for a shortish bit, then back on for the final six Strauss songs, all of which are on the CD. It was a thrill to hear them sung even more beautifully (with five or six years’ more life/musical experience under his belt since the recording) and I kept having to pinch myself to believe I was actually hearing him live! The audience clapped enthusiastically if not standing-ovation-like at first, much to my disappointment! He eventually did five encores and each time the crowd was more and more enthusiastic; by the end there was wild applause and a standing ovation. Four of the encores were more Strauss that I knew from the CD, but he finished with “Dein ist mein ganzes Herz” and as soon as Helmut Deutsch started up with the schmaltzy music a great cheer went up from those of us who knew it. As he finished that song, I commented to my neighbor, “He’d better wave to the crowd or something if he wants to get out of here”–and he in that moment waved to the audience and did not return. I called it! Afterwards I hadn’t figured out where the stage door was, so I decided to be a dork and ask an usher. He asked if I was ‘on the list’ NOOOOOOoooooo *sigh* I’m a nobody and have no reason to be on the list so I didn’t even try. Anyway I got directed to the stage door where there was a crowd of about 30 (?) people. They weren’t organized into a line, which was of course annoying to my schoolmarmish nature, and the more assertive ones kept pressing forward, leaving me on the outside ring. After loads of folks came out including Bryn Terfel (another singer) who was very sweet and after about half an hour (not long for such things, I know), JK appeared and was already begging for indulgence and wanting to leave. (For those like myself who wondered, he is indeed tall; that is, he was head, although not head-and-shoulders, above most of those crowded around. About 5’11”? I come from basketball world so of course “tall” is a VERY relative term for me. I think he must have sung with a number of very tall sopranos as he does not look particularly tall onstage). I nearly panicked as he was mobbed by fans more pushy than I (I was on the outer rim of fans) and he kept begging everyone to let him leave. It became clear I was not going to get a photograph or even ask my question (please will there be a Bieito Fidelio DVD?) I finally made my way forward politely, said exactly “Thank you” with eye contact and got my book squiggled in but the adrenaline was clearly gone and he was anxious to leave. So that is my story! I am no music critic, but in my mind it was PERFECT! Well worth the money and effort involved to see Jonas Kaufmann singing lieder and I would put myself in even more debt in a heartbeat to see him live again, especially singing lieder. I can’t imagine what Faust will be like. Susan and I have tickets for the December 3rd performance of that. And I really, really, REALLY want to see Die Walküre live. Really. Have I said that enough? Even if there is no windfall or lottery win I will try to make that dream happen. Hopefully the Ring cycles will not be sold out and there will be individual performance tickets. Update: Well, I have since learned a few things that have a bearing on what I experienced so I’ll add a little update. First of all, in a recent interview, JK said that recitals are far more exhausting than singing opera. The amount of concentration required is incredible and I would imagine the added necessity of continually judging the right volume for singing lieder in a place like the Met would have made it even more stressful. He certainly looked completely exhausted afterward. I hope his next CD will be lieder, and I hope it includes the Liszt, Duparc, and Mahler. The more I listen to them, however disappointing the recording was, the more I enjoy them! And I did find out that, just like January’s Don Carlo from Munich, there will never be a DVD of that streaming Fidelio. I would guess that, after these two experiments, the bigwigs in Munich are sitting around figuring out how to “monetize” their “content” as we in the book industry say. They have already begun to “granularize” it by putting several arias from Don Carlo up on YouTube! 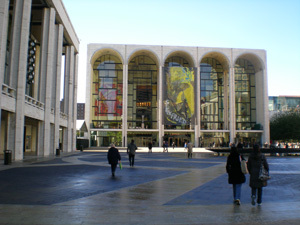 This entry was posted in Uncategorized and tagged Jonas Kaufmann, Met Opera, Recital. Bookmark the permalink.